For the last couple years I have noticed that the jet stream has been moving further south in its random meanderings. It now reaches below the 45th parallel. This is partially due to global warming and a combination of the normal 11 and 22 year sunspot cycle. The jet stream acts as a barrier to arctic air masses - primarily high pressure (clock is high on the wall = clockwise) air masses that mean cold air. 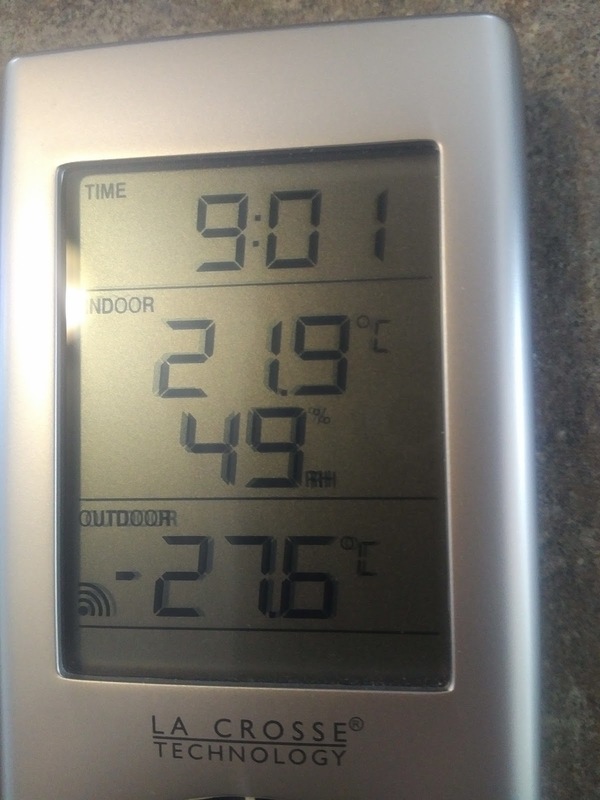 Today (13/02/2016) I noticed the temperature dipped to -28c (-19f) - which means a 50c (90f) difference between the walls of our house. 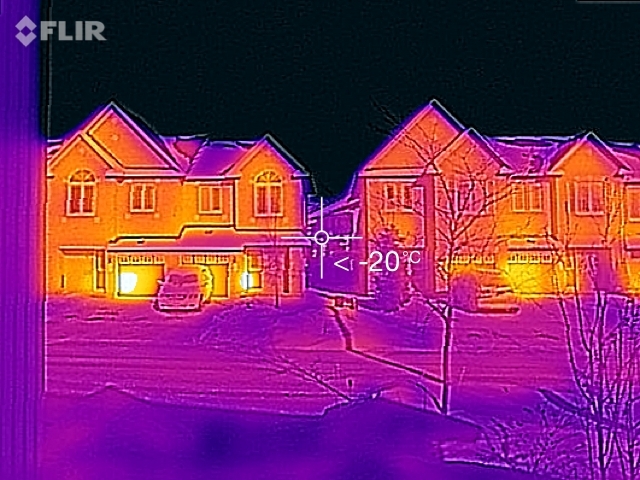 My FLIR camera is required to get a correspondence second reading - unfortunately it is not made for Canadian weather. The FLIR will work in Alaska along the coast which is warmer than us today. The canal will be excellent for skating today - except for the wind chill which at 20kph may mean close to -45c temps. The 5 baby geese made it over the curb with about 100 cars on hold from 3 directions - thank you to the police service. I was at my brother in law's place on the shore of the large lake beside Westport, Ontario, Canada. An absolutely amazing phenomena happened. We stood on the lake for about 15 minutes when an expansion wave went through the lake and passed under our feet at a speed that felt like the speed of sound. Everyone has heard cracks when on the ice - but this was something completely different and very rare. It seems that the ice at this early stage in its development has not developed any major defects or cracks and when it undergoes expansion due to further freezing as the night falls. The wave of molecular expansion can be heard a mile away approaching and felt as it moves your feet a fraction of a milimeter and then hits the shore. The sound is sort of like a light sabre sound just under your feet. The following graph is the result of an experiment where I varied the number of cores used to render each frame of a deep zoom to the limit of ''double'' floating point precision. When I run this algorithm as a traditionally single threaded application it takes up to 800 seconds to render a 1024x1024 grid from 1.0 to 1 x 10^-16. However when I start adding threads I see the best speedup when I use the same number of threads as there are hard processors (non-hyperthreaded). The performance increase nears it's maximum 8 times increase for an Intel Corei7-920 when I approach a thread/line of 512 threads. As you can see from the graph, we benefit more from a massive number of threads - as long as they are independent. 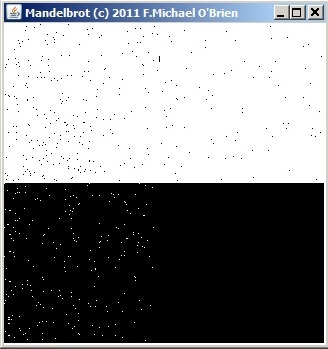 The Mandelbrot calculation however it not homogeneous - computing the central set requires a lot more iteration than outlying areas. This is why each parallel algorithm must be fine tuned to the problem it is solving. If you look at the screen captures of performance during the runs with various thread counts you will see what I mean. The processor is not being exercised at it's maximum capacity when the ''bands'' assigned to particular threads are finished before other threads that are performing more calculations than their peers. If we increase the number of bands - we distribute the unbalanced load among the cores more evenly - at a slight expense of thread coordination/creation/destruction. For our multithreaded Mandelbrot application - which currently is not @ThreadSafe - we encounter resource contention specific to the Graphics context. This type of contention is the same for any shared resource such as a database. The issue is that setting a pixel on the screen is not an atomic operation - it consists of setting the current color and then drawing the pixel (The Java2D API may require multiple internal rendering steps as well). The result of this is that another thread may change the color of the graphics context before the current thread actually writes the pixel - resulting in noise - or more accurately - '''Data Corruption'''.